Casablanca is a motion picture released in early-1943 by Warner Brothers, starring Humphrey Bogart, Ingrid Bergman, and Paul Henreid. 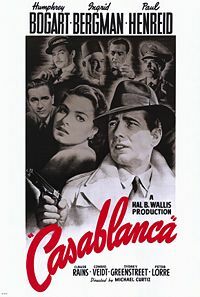 Intended to have been just one of a number of films produced on a tight "B"-movie budget, Casablanca instead became one of the greatest and most successful films in cinematic history, earning Academy Awards for Best Picture, Director, and Screenplay; a place on the National Film Preservation Board registry and inclusion in the American Film Institute's top two motion pictures . Casablanca has been praised by critics and loved by audiences alike for its romance, the chemistry between Bogart and Bergman, the depth of its characterization and story, and the splendid direction of Michael Curtiz. Refugees from Europe fleeing the Nazis cross the Mediterranean Sea for temporary refuge in unoccupied French Morocco; from there they hope and pray to make it to neutral Portugal and eventually to America. In Casablanca, everyone comes to Rick's Café Américain, where the desperate hope to make a deal to get them out, and where Rick himself - a bitter, cynical ex-patriot - stays and sticks his neck out for nobody. But important documents come his way which would allow anyone to leave without question; documents wanted by the Nazis, wanted by a popular resistance leader...and wanted by a lover who left him standing in the rain. The film actually has a beginning not unlike the situation it portrays. Murray Burnett and Joan Alison were two playwrights on vacation in Europe when the Nazis began their march across France in 1940, and soon they found themselves in Marsailles at a cafe in which hushed conversations were the norm among the fleeing well-to-do and those who were not; all were looking for a means of escape, and keeping a sense of order in such a situation was a band led by a black piano player. Convinced that they had the makings of a great play, Burnett and Alison soon completed work on "Everybody Comes to Rick's". The play was never produced, changing hands a number of times (Louis B. Mayer of MGM turned it down flat) between film studios before landing on the desk of Hal B. Wallis at Warner Brothers after being purchased for $20,000. This page was last modified on 7 February 2018, at 20:29.